I Believe In A Thing Called Love was my first read from Maurene Goo and it instantly charmed me. I knew after reading that book that I would read pretty much everything from her. This book made me very happy and I'm so pleased to have read it. 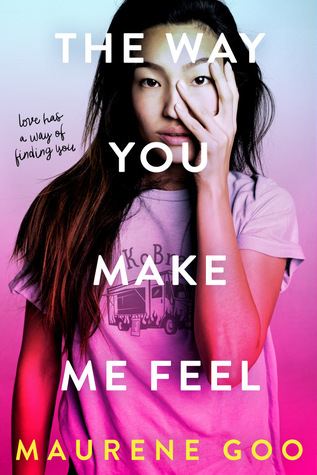 I love reading books about heroines who are sassy and smartasses and Clara, the main character in The Way You Make Me Feel, certainly had a flair for the dramatics. Her personality was so entertaining and it was a blast to read about all the shenanigans she got herself into - and let me tell you, this girl here was a troublemaker for sure! When this lovable prankster gets into trouble at school, her dad forces her to repay for her actions by working the whole summer at his food truck. Of course, this seems to be a complete nightmare for a girl who is looking forward to spending her time with her Instagram famous mom. Clara was a breath of fresh air. She was a flawed girl and she made so many mistakes throughout the book, but eventually, she learned from them and realized the wrong she did. I don't know about you guys, but I love reading about teen girls that learn and grow and Clara's story was just lovely. There were many great relationships explored in The Way You Make Me Feel. Perhaps my favorite though was Clara's relationship with her dad. He was just an adorable human being and his bond with his daughter had me weeping in joy. Their love and support of each other were so pure and prevalent throughout the book. A+ to Maurene Goo for depicting a wonderful father-daughter relationship. Her dad, Adrian, himself was such an interesting character. I loved learning about his life and his passions for cooking. We also get a great nemesis to friends relationship in this book through Clara's relationship with Rose, whom she is forced to work with over the summer at the food truck. These two initially did not like each other AT ALL, but they actually get to know each other quite well through having to manage the food truck and become good friends. It was such a sweet and genuine relationship. There's also a romance with a sweet kid, Hamlet, that I didn't swoon over, but I still thought it was cute. I also have to mention just how vividly Maurene Goo brought LA's food truck culture to life. The food descriptions were honestly mouth-watering! The Way You Make Me Feel is one of those books that delighted from start to finish. I had such a great time reading it and I highly recommend it, especially if you're looking for a good YA contemporary book with a strong focus on family and friendship. What are some of your favorite fictional father-daughter relationships?